From bubble to bib statement necklaces have defiantly been making their mark on summer trends. Although, they have been a key part in fashion for a while now. Of course I fantasize over J Crews perfect neck candy. However not everyone has the budget for that (aka me). So, here are my statement necklace finds and favorites. This gold piece is nice and chunky. It goes with practically everything because I personally wear more gold then silver. It is from H&M and I got it on sale for about $5. I highly suggest looking at sale stuff when it comes to this kind of trendy jewelry that may not be in style for a long time. Also another H&M sale item. This one was around $3 I would say which is a great deal. The beads have a iridescent effect which is really cool up against different colors of clothing. Again, it is nice and junky and defiantly stands out. When I want a pop of color I grab this bib necklace from Dry Goods. I got it on sale for about $10 and it was part of a buy 2 get one free deal. This magenta color surprisingly compliments a lot of things I have. It's a comfortable necklace and it isn't to bulky. This necklace is surprisingly from Target. I had never looked at Target's jewelry until I got this necklace. It was on clearance for about $4. It's pretty nice quality and it just adds a bit of sparkle. 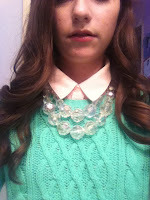 The classic bubble necklace, although mine is not from J Crew I got this one at Charming Charlie's for $20. But, I had a $10 off coupon so it was only $10! Which you really can't beat. This piece goes with so much. Although it jingles as you walk I still love it. This Juicy Couture necklace is my go-to rose gold option. It has very nice stones all around and a pave toggle closure. Sometimes it gets a bit heavy but its worth the pain because I love this piece. Lastly, a new addition to my collection. This necklace is from J Crew (factory outlet). I am not sure if it was ever at the original J Crew but it's still amazing if it wasn't. You can tell how nicely it's made which is good because even on sale this necklace was not $5. But, the outlet store had 50% the whole store so I had to take advantage of a good sale and pick it up. Just like my arm candy I am always wearing something around my neck. Here are some of my outfits that feature a bold necklace. Statement necklaces, I think, take your outfits to the next level. It's that one tiny thing that makes everything come together. These outfits are from prior seasons.